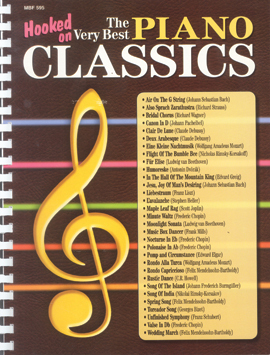 The very best of our classical arrangements in one volume. Includes: Air on the G String (J. S. Bach); Also Sprach Zarathustra (Strauss); Allegro (Haydn); Bridal Chorus (Wagner); Canon in D (Pachelbel); Clair de Lune (Debussy); Eine Kleine Nachtmusik (Mozart); Hungarian Rhapsody No. 2 (Liszt); Maple Leaf Rag (Joplin); Moonlight Sonata (Beethoven); Music Box Dancer (Mills); Song of India (Rimsky-Korsakov); Waltz (Brahms); Wedding March (Mendelssohn-Bartholdy), and more!